I had a “Whoa!” moment this week. But, I am not sharing exactly what it is just yet. I know! I know! I’m mean for saying anything at all. But, the point I want to make about the “Whoa!” moment is…So many times we trudging through our lives wondering what the hell we are doing. We wonder if all the little things are ever going to amount to anything–big or otherwise–or if we are just doing them because we want to, feel we have to, or some notion of needing to suffer while paying our dues. We search for meaning in the small moments because we tend to never get smacked upside the head by one of them in the way a “Whoa!” moment does. Here’s the thing. Everyone wants a “Whoa!” moment…but “Whoa!” moments only live on the path of little things. If we are not exercising all the little things, we lull ourselves into a false sense of woe. We complain and conclude we must be unworthy of, “Whoa!” so we feel woe. Worse we settle for less than we want out of life. Of course, this also applies to weight and health. I do have a lot of bottles on my desk. Two prescription bottles because my dorky body likes an odd number of milligrams when it comes to thyroid medication. The other five bottles are vitamins. Vitamins are such a little thing. Not just as a pill to swallow but for real. The physical amount our bodies need for optimum health of each one is so tiny our kitchen measuring spoons would be too large. And yet, just this week alone I have seen at least four people complain about their need to make sure their bodies have enough of these health-giving compounds. Everyone wants the “Whoa!” moments of health but if they have to do anything to help themselves they woe all all about it. My, “Whoa!” moment happened because–at least in part–of my willingness to take my vitamins as one of the little things I do to help my body avoid so much pain and woe. I am not doing all the little things I know I should be doing. It’s 11 a.m. in my world and I haven’t eaten breakfast. I have been up since 8:45 a.m. so for me this is crossing the line into my well-established, well-known personal danger zone. If I know it’s dangerous, why am I letting it happen? At least nothing credible and not a line of BS. I have also let myself teeter on the edge of dehydration at least three days this week. Again, I don’t have a good, credible reason. My desk is maybe eight steps away from the kitchen sink. That’s mostly laziness and apathy right there but a tiny bit of losing my focus in the throes of the “Whoa!” moment. I haven’t used my exercise bike and I have only taken one walk. Okay here’s where I do have something valid–okay mostly valid–my exercise bike is still outside. If I could pick it up by myself it would have been in the house already. Yes, I’ve asked the hubs…repeatedly. As for taking additional walks, well I don’t really have anything valid there either other than on at least three of the days my mornings were awful and the evenings were still over 100 degrees at dusk. I could use it outside…but…umm, no…and yes I recognize my no is a good amount of BS. The truth is: I can do better. The truth is: For this “Whoa!” moment to stay “Whoa!” and not woe, I have to do better. The truth is: If I decide I’ve “made it” so now I can relax, not only am I lying to myself but I am not being accountable to my body and my dreams. The truth is: Sometimes “Whoa!” has another meaning, “Stop”…Stop and take a moment to make sure you have not let go of the little things. The path is there for a reason. It might be tempting to wander off in the field but the path has lessons for you and you have to be willing to learn them. 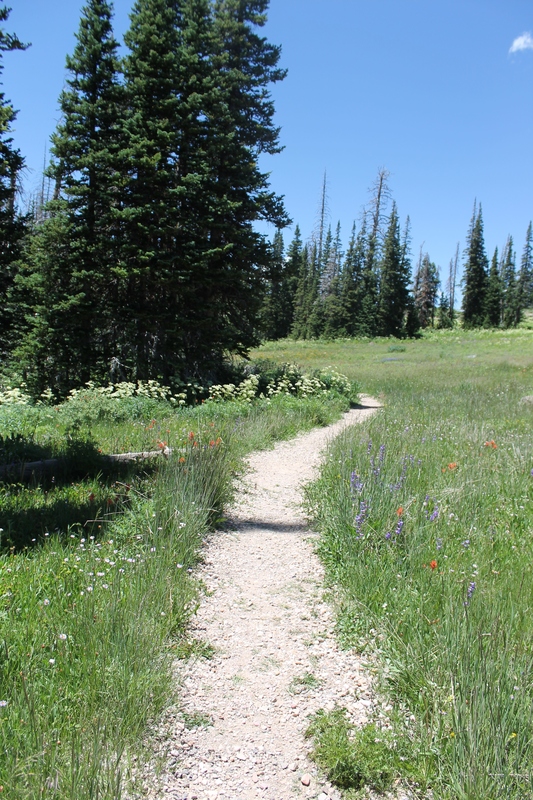 This is the Campground Trail at Cedar Breaks National Monument. Week 37–Does This Feel Right? Late again…but with good reason. I battle a migraine that started on Friday afternoon and spent most of the day in bed yesterday trying to beat it back down. It was a good move because I woke up this morning feeling much, much, much better. Whew. So how did I do last week? All pains considered I did okay. You see I had been feeling a little silly about finding my ‘right’ spot to write. Last week I figured out how previous spaces left me feeling uncomfortable to the point it effected my writerly process. I had been battling the feelings of needing rightness to be writing. Then I watched an excellent documentary on Ushio and Noriko Shinohura called “Cutie and the Boxer”. They are both artists. But Noriko struggled to find and claim her place. The part of the documentary which focused on her really stressed her journey to find her voice. She said these words by Virginia Woolf helped her realize how much their ‘starving artist’ struggles were effecting her. She also realized that she was not claiming her space. Everything clicked. No. It is not silly to need my space to be MY SPACE. I have never been a cubicle person but as a writer I like my space to be small and cubicle-like. I have been trying to explain to my hubs how I can write through distraction but not interruption. For him, they are the same. For me, they are miles apart. For whatever reason, I need my writing cave which is has a much better ring to it than cubicle (what a horrid word). In our tiny house, I do not have a room of my own but that does not change the fact I need to claim my space. Now what does any of that have to do with my weight loss journey? Improving health is all about claiming health. Every decision–food, fitness–is a lot like finding the right space to write. You have to keep moving things around until you get it right. You have to be willing to try. You have to be willing to fail. You have to find the gumption to keep trying through strings of failures. It is asking yourself, “Does this feel right?” and then accepting the answer. I have typically been eating two meals and one snack a day. My normal is six mini meals or three meals and two small snacks. They help me keep my body fueled and I have so many opportunities to sneak extra fruits and veggies into my day. I have been a crank-monster and I know being hangry is a good bit of the reason. I could be doing a better job about sticking to my bedtime. Yes, I am 45-years old and I have a bedtime. It is vital to my health. I don’t love it, honestly. I would love to be a free spirit who floats through life sleeping and waking whenever but my health just won’t tolerate it. If I am not asleep by 11 p.m. I am stealing joy from my waking hours. I don’t have to love it but I do need to respect it. Liquids. Oy! Now that the weather is cooling down the urge to drink is not as strong. I go through this every year. I need to do a better job of making sure I am drinking. The bottom line is when all these things are off I have little chance for a happy, healthy, productive life. Having that life is the ultimate goal so I need to take all the baby steps to get there. It helps me feel right….to respect my writing cave…and my body. Used without permission from the source. I like this but it’s not quite me. 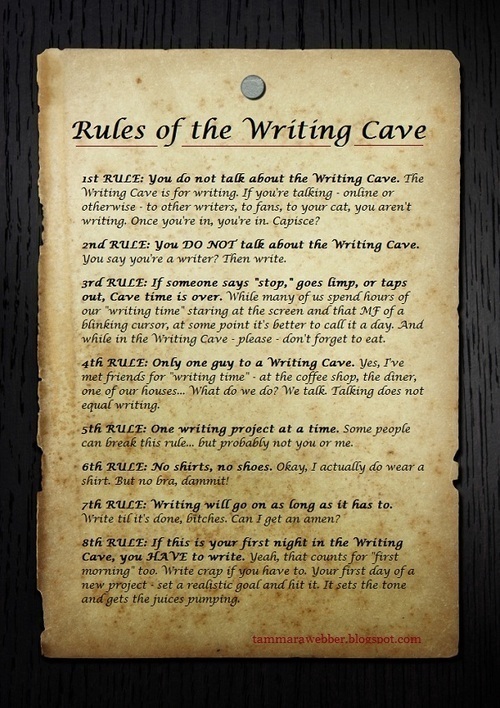 I think I need to create my own cave rules. Maybe that is a word you do not consider when it comes to your health and your weight. But I am absolutely confident that “renegotiating” is one of those life skills that must be a part of this conversation with your body. Why do I believe that to be true? Well, for the simple fact you are not in control of your body… At least not complete, total, 100-percent control. The truth is there are things that are going to happen in your life that are going to affect your health and/or your weight that you will have no control over. They will be unwanted. They will be unwelcome. They may even be devastating. You learn how to renegotiate with your body and with all forces which may affect your goals. No, my miracle didn’t happen. My months-long plan that was to culminate on 9 September slipped away. Fortunately for me, fibromyalgia and Hashimoto’s Thyroiditis have been wonderful teachers in the art of renegotiating my will with reality. Was I disappointed? Uhh, like totally! But, a little research, a conversation with my hubs, and a phone call coupled with my well-honed renegotiating skills and a new plan was in place in less than a day. Was I still disappointed? Of course. Whenever I don’t get my way, I’ll admit that I get frustrated, angry, and I might even throw a tantrum or two. However, this was not one of those times. This time, I chose to save my energy for other things. The research, the conversation, and the phone call took a couple of hours to get my head back on straight. It took my heart probably the rest of the day to come on board with the new plan. But, I didn’t really even lose the whole day to it. Now if you’ll recall this mystery event coincided with my plan to pull my body back on track. So then I was faced with a choice: Do I use this as an excuse to stay off track? Or, do I put one foot in front of the other and walk the line? Here’s the thing I know… If in your heart of hearts you are looking for any reason, anyway out, any excuse to get out of achieving your dreams and your goals you will take the first exit provided to you. Oh sure you say you really want the goal but deep down there is something you are not addressing which makes you feel like you do not deserve that thing no matter how much you want it. If you’re reading this, and anything is leaping to your mind–weight loss, health, personal, or professional–I want you to know I absolutely understand. The most significant part of this journey–this more than decade long journey–I have been on to reclaim a healthy weight has been jettisoning all the crap other people have piled on me along the way. For sure, at least best that I can remember, other people have been telling me just how unworthy I really am of my body since I was four years old. People, that’s a lot of crap to unload. It takes work. And, time. And, love. And, courage. I started where I was with what little I had and I put one foot in front of the other. My toes are gripping that track like a gymnast grips a balance beam. I am hanging on for dear life… Because my life, dreams, and goals dear and because I have finally learned that I matter, that my dreams matter…I can move forward. The event is rescheduled but the event is not my reason for this journey. I am. I do not need to get my way. I do not need a perfectly normal body. I do not need the love, the acceptance, and the support of other people. I need to keep renegotiating my path… Not my dream… My path… And that is the difference that I feel right now. Folks, I’m a gonna try real hard to keep my brain from splattering all over the page…but WOWSERS…my mind and heart are really full right now. I feel like that box of cake or muffin mix that has been banged and jostled to the point each fine grain is sticking to its neighbor. Opening the package is not going to produce a gentle cascade but one giant clump. So here’s where I am at accountability wise… We are still reeling financially from the move. The move itself has been good to great but it has knocked everything in our financial world off kilter. We will get everything figured out but it is going to take time. Honestly, where food is concerned right now it’s not a matter of eating good food as much as it is having any food to eat. And, whenever it is possible I make the best choice I can. Right now, it is good enough. I am grateful for food while wishing I had extra money for fresh vegetables and fruit. One of the things I am congratulating myself about is is I’m not over here enjoying the empty, but cheap, carbs and the lack of veggies. In fact, the first thing I can smell when I go to any store is the produce section. Yes, the produce! Even over freshly frying chicken and doughnuts, I’m ribbing my son saying, “Oh my gosh…Can you smell those carrots from here or what?” He just blinks at me slowly like I’m some sort of deranged mental patient. The carrots are actually more than 10 feet away but I can smell those babies like a bloodhound on the hunt. Earthy. Sweet. Fresh. Delicious! Then there’s this other thing that may or may not be happening on Wednesday. I haven’t shared it before and had planned to today but $150 for new brakes on my hubs work truck means it is in very real jeopardy of not happening. I’m sad and honestly a little mad. It isn’t his fault or the truck’s fault but at the same time this thing has been planned for almost two months and there’s a very narrow window of opportunity. That I might miss it is just knotting me up inside. I am not sure how to deal with it mostly because I am holding out hope for a miracle. Clear as mud, right? Right. Furthermore, my restart was timed with this mystery moment but with our financial picture not shaking out the way I had hoped it might not be wise to put myself under that sort of pressure right now.